The old analogy “If it doesn’t kill you, it will make you stronger!” does not apply to Haskap. Why should the food that is good for you taste bad. That is not the case with Haskap. Haskap has a sweet tangy zing flavour that most people say is a cross between blueberry, raspberry and black currant. Haskap has long been known by the ancient Japanese as, “The fruit of Life longevity and Fruit of vision”. As you can see from the attached Nutritional Guarantee to the right, this fruit is high in Vitamin C and A along with high fibre and potassium. While antioxidant charts are useful in promotion of products, more and more scientists and manufacturers of nutraceuticals find that actual levels of the various compounds that make up the category of anti-oxidants are much more important. There are many different types of anti-oxidants that have varying levels and functions in all foods. Studies investigating health results are based on these actual chemicals and not antioxidant levels. So what are Phenols, Anthocyanins and Bioflavonoids? They are many different type of compounds known as anti-oxidants. Each one has different types of health properties and levels in different foods. The ORAC value is being used more often in determining the oxidative capacity of foods. 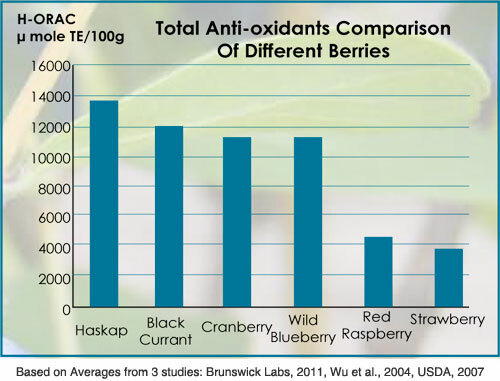 This chart shows the ORAC values for several berries common in Saskatchewan. Haskap berries have an extremely high ORAC value and specifically they have high levels of Anthocyanins, Poly Phenols and Bioflavanoids.